I have crew openings for an off shore passage from Jacksonville, Florida to Beaufort, N.C. The passage will take 3-7 days depending on weather and will depart on or about May 15th. Crew will bear the cost of transportation to Jacksonville and from Beaufort. I will bear the cost of feeding the crew. Crew is expected to provided personal foul weather gear and safety equipment. 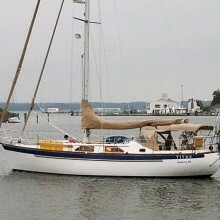 The vessel is SV TITAN a 1981 Slocum 43. She is a well equipped double ended cutter displacing 18 tons. Experience is a plus but not necessary. I will avoid foul weather unless caught out and if needed will use ships engine to maintain an average of 5.5 kts. Boat descriptionSV TITAN is double ended and cutter rigged. She draws 6.4' and has a 13' beam. She's heavy at 18 tons but a comfortable ride in all but the worst weather. She carries 150 gallons of fresh water and 80 gallons of fuel. She carries most modern electronics to include: chart plotter (2), annonometer, Apparent wind indicator, knot log, fathometer, AIS (transmit & recieve). She is outfitted with most safety equipment with the exception of a life raft. I avoid the AICW, preferring to sail off shore. I generally wait for a favorable weather window before heading off shore. If possible, I use the engine if boat speed drops below 4 knots.